Well, I've been a little slow to get things rolling this deer season. The deer starting out made a mockery of my slow bows so I backed off till things felt right again. This weekend was the gun opener here in S Texas and I took my wife to a non-managed property to get some meat for the freezer. As luck would have it, a nice little 8 point crossed my path this morning at around 7:00am. It was his last morning. Took him at 6 yards with my Hummingbird "free spirit" that I acquired from Chad Jones, a carbon arrow from Tom Davidson, and a MR-3-S Broadhead from Jerry Wobble... All three tradgangers were with me when I dropped the buck. He is no monster but Im a proud hunter anyway. 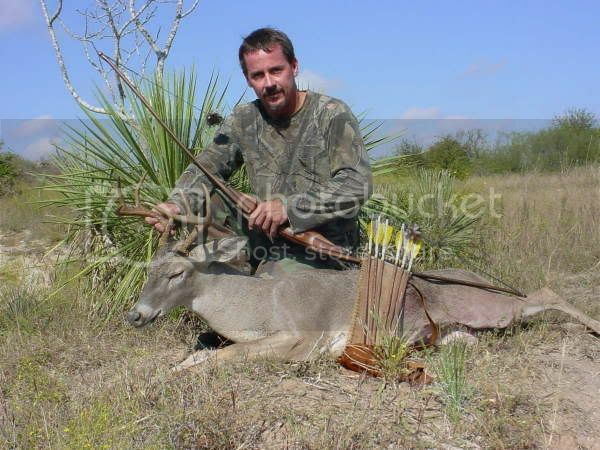 Nice buck Curtis! How do you like the MA3 head? "He is no monster but Im a proud hunter anyway" Hey CK,looks good ta me,the hunt defines the trophy anyways! !